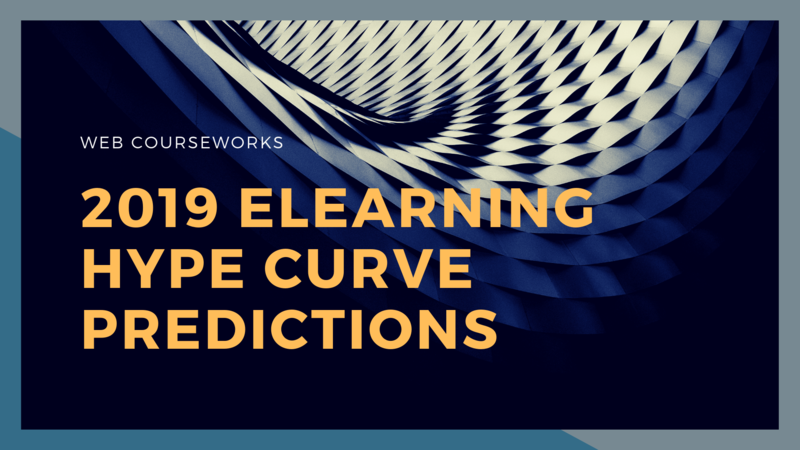 Around New Year’s Day each year, we issue our predictions for the top eLearning trends of the coming year. In the past, we’ve plotted these predictions through dead reckoning – relying on our experience living, eating and breathing online learning all day, every day throughout the year. But this year, be warned: we come armed with #data. We’ve based our predictions on analysis of over 2.3 million words used on Twitter, meaning you’re not just getting our opinions: you’re getting a read on the actual “hype” out there in the industry. The Gartner Hype Cycle is the underlying theory of this project. The hype cycle theory holds that new concepts and technologies are initially little known, and thus little discussed, when they emerge from their Innovation Trigger – the point at which someone dreams them up, and only a small group of cognoscenti knows of them. As people become familiar with new innovations, they are “hyped” until they reach the so-called Peak of Inflated Expectations. The Peak of Inflated Expectations is so named because, at this point, the concept or technology is incorrectly seen as a solution to all problems in the field. Not fully understanding the new thing, people invest their hopes in it. During this period of maximum hype, the new concepts become incessantly repeated buzzwords that are routinely slotted into conference presentation titles, blog posts and social media jottings. Inevitably, the new thing turns out not to be a cure-all for all problems, leading to disappointment for those who had hoped it might solve their specific problems. The concept or technology descends into the next stage of the hype cycle: the Trough of Disillusionment. At this point, many commentators complain bitterly about the concept or technology – sometimes offering valid critiques, sometimes unfairly knocking it for not being a solution to a problem it was not meant to solve. Seeing the negativity around the word, people stop using it in the titles of articles, blog posts, and conference presentations. The word ceases to be a true buzzword, and is used less frequently. Finally, some group of people learns how to use the new concept or technology to do useful things. The discussion of the concept or technology increases a bit – never reaching the previous level of buzz, because the only people with reason to discuss it are the actual users – and reaches a moderate, stable level: Gartner dubs this phase the Plateau of Productivity. As mentioned above, we based our analysis on over 2.3 million words drawn from that epicenter of all buzz in 2018, Twitter. Our idea was to quantify buzz by looking at what influential people in our field were tweeting about. To that end, we built a list of about 40 influencers: a mix of people we personally follow, people mentioned in an article about eLearning influencers, and, once we started to gather data, an expanded list of Twitter handles that our influencers frequently linked to (or, as the kids say, ‘@ed’). We then wrote a program that hits Twitter’s REST API to pull as many tweets as we could from those accounts. Eventually, we built a dataset of over 60,000 tweets from about 40 online learning influencers, and a like number from a control group of journalistic influencers. We also used a Python web-scraping library to get the titles of webpages shared by the eLearning influencers. To class words into the five hype curve categories – Innovation Trigger, Peak of Inflated Expectations, Trough of Disillusionment, Slope of Enlightenment, and Plateau of Productivity – we used two factors: what we called the words’ max hype and their slope. The max hype was the maximum proportion of eLearning influencers who tweeted about the term during any month in 2018. For example, exactly 50% of our influencers used the word microlearning in at least one tweet in January of 2018. This was the highest proportion for microlearning for any month in the year, so microlearning had a max hype of 50%. We used max hype to determine whether a word was at, or around, peak hype. A word that had a max hype over 25% was judged to be somewhere near the Peak of Inflated Expectations, either increasing or decreasing. A word with a max hype above 12.5% was eligible for one of the other categories. In the plot, the black dots represent individual data points – the proportion of influencers who tweeted the words AI or artificial intelligence each month from December 2017 – November 2018. The solid blue line is the linear regression fitted by R: it shows that while the individual data points vary randomly from month to month, in general the proportion of influencers who tweeted about the word increased (moved up as you move from left to right) throughout 2018. Finally, the grey dashed line is a smoothing line fitted to the data points. 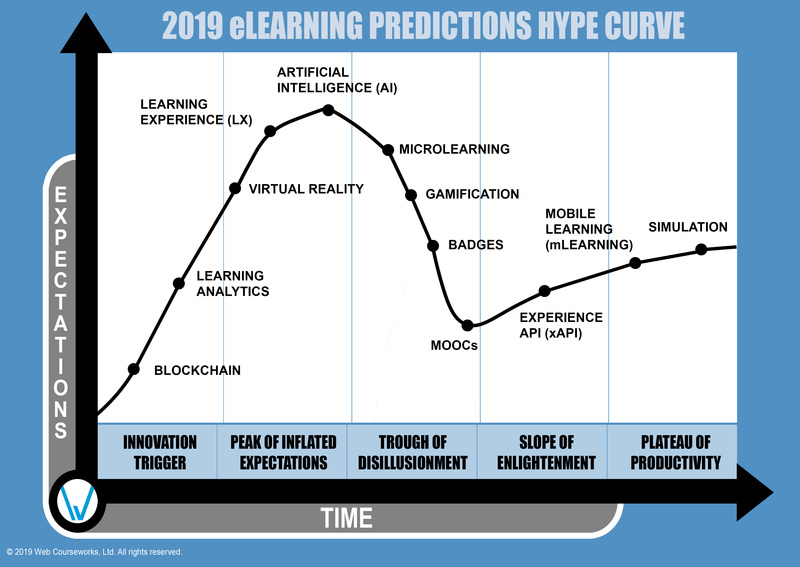 It suggests that the hype around AI in the field of eLearning might have peaked around July, and might have started to decrease later in the year. Before we read too much into that gray dashed smoothing line, however, we have to stress certain limitations on our model. Because the Twitter API limits how much data we can pull from each account, we weren’t able to gather much data prior to 2018 – so we are looking only at data for the last year (starting actually in December of 2017, because we can get a decent amount of data for that month and don’t yet have complete data for December 2018). There may be “macro trends” that are only visible if you zoom out further than a year. We also noticed that many of our terms “peaked” around July – September, perhaps suggesting a seasonal effect – perhaps people tweet more about buzzwords in the summer for some reason? It would take a robust multi-year dataset to identify and correct for a seasonal effect like this. We hope to continue to build our hype database throughout the year so we can do more extensive analysis next year, but for now we’re limited to this relatively small dataset of just 2018. Until we get more data, it’s smarter not to get too fancy in our analysis, and therefore we are more confident in the linear model (the solid blue line), which gives us reasonable confidence that we get the overall direction of the hype around a term, rather than any curved model (like that gray dashed line or a fancier regression model), which might just be showing us random movement based on limited data rather than a reliable trend. Our new data-driven approach led us to some recalibration of where we place various concepts on the hype curve. That’s a fancy way of saying “we were wrong” about some of these terms in the past: if you go back and compare this year’s predictions to last year’s, you’ll find that a few of these terms have actually moved backwards on the hype curve. Blockchain is the technology between Bitcoin and other cryptocurrencies. 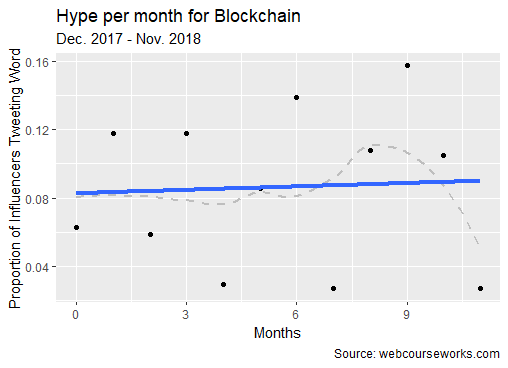 At the Peak of Inflated Expectations in the general startup world, blockchain has just crossed the threshold for inclusion in our eLearning hype curve. Its potential uses in online learning are yet to be fully explored, but it promises a way of keeping a secure ledger of transactions, which could have useful applications for tracking CEUs/credits in continuing education and certification scenarios. 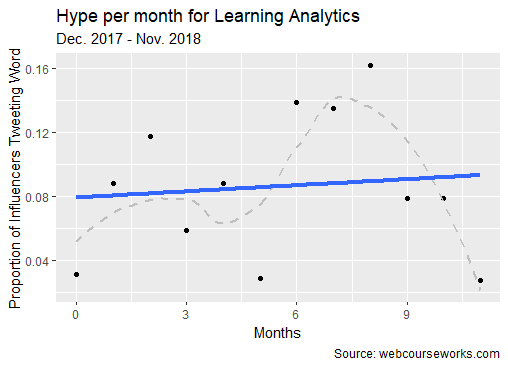 Learning analytics is the use of data about learning and visualization of that data to describe what is happening, predict what is going to happen, and prescribe the best strategy moving forward. (The project behind this blog post is one example of learning analytics, in a sense.) Inspired by the general business popularity of business intelligence tools like Tableau, Qlik, Domo, and Microsoft PowerBI, many firms have emerged in our space in recent years offering dashboards for decision makers in associations, and we know of startups and new products geared specifically toward learning data. Artificial intelligence (AI) blew up in the field of eLearning in 2018. 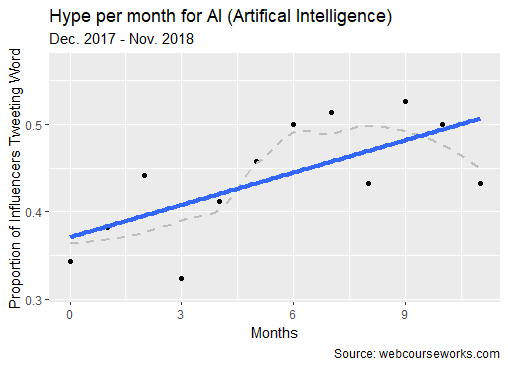 The term had the highest slope of any buzzword in our dataset (an annualized growth rate of over 14%), and also the highest max hype (over 52%). AI is a broad term with a long history that these days usually means the use of machine learning algorithms to build “untrained models” in which computer programs find new and unpredictable ways of solving problems. AI powers your Netflix recommendations and your Google translations. It seems obvious that it should have applications in learning – for example, in recommending activities to address learning gaps – but the devil is in the details. 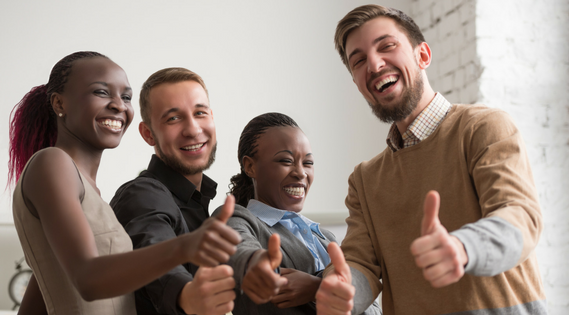 Learning experience (LX) is hyped as a new class of learning application or platform, different from the traditional LMS in that it affords more opportunities for informal learning, microlearning, social learning, mentoring, and sharing. Tied in obscure ways to the technology of xAPI (see below), it is pretty clear that the learning experience platform (LXP) is a cure-all for everyone’s complaints about their LMS, and simultaneously it’s also clear if you dig into the details that the best LMSes already offer LXP functionality. Given these heightened expectations, it is difficult to imagine we won’t soon find the term in the Trough of Disillusionment, but with the second highest slope in our dataset, we think LX has at least another year at the Peak of Inflated Expectations in it. Virtual reality (VR) is the use of technology to simulate an immersive, 3D experience. A linked technology is augmented reality (AR), which uses technology like Google Cardboard to superimpose computer-generated graphics on a user’s view of the real world. 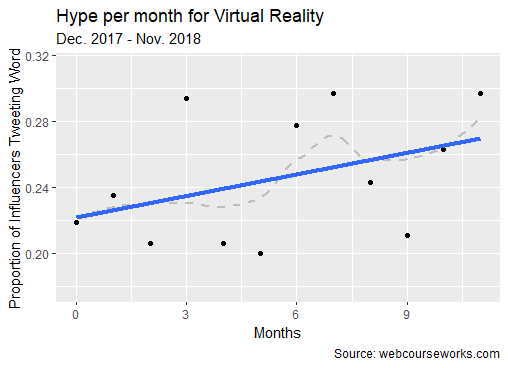 The graph below somewhat underplays the hype surrounding VR and AR due to our methodology, as we did not aggregate the AR tweets with the VR tweets. AR was quickly growing; taken in aggregate, we think the term still qualifies for the Peak of Inflated Expectation and will likely stay there for another year as learning professionals continue to get excited about the potential use of this technology for very high fidelity simulation and other learning experiences. The Trough of Disillusionment is crowded this year, with a number of new entrants joining a host of concepts that have been mired here for a year or more. 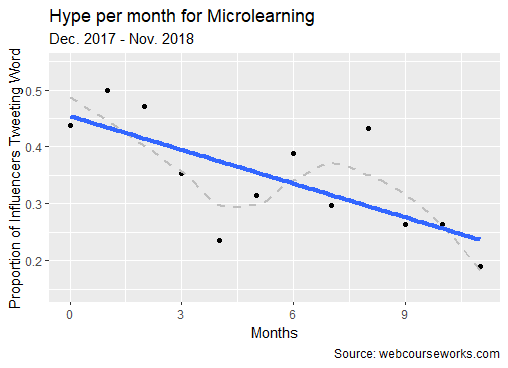 Microlearning had a rought 2018. It had the most negative slope of any buzzword in our dataset – a staggering -23% on an annualized basis. This trend is undeniable in the graph below. 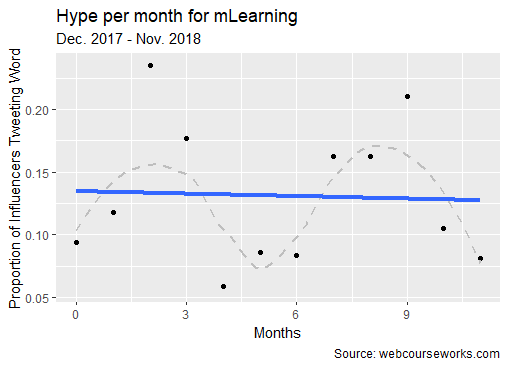 Paired with a very high max hype of 50% – set at the beginning of the year – it’s clear that microlearning is now plunging – no, hurtling downward – into the Trough. We’ve blogged about these inflated expectations (as well as microlearning’s genuine productive uses) at length already; so suffice it to say that microlearning is a valuable concept that had far too many expectations hung on it by the chattering classes. Gamification is the idea that awarding points and levels and badges to your boring eLearning can make it engaging. See any problems there? 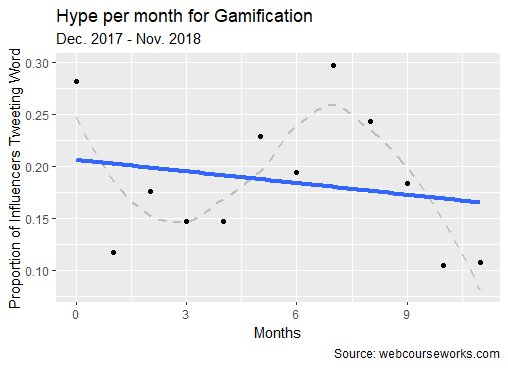 We’ve already ragged on gamification (see last year’s hype curve blog post), so we won’t repeat ourselves here. Badges are closely tied, in the eLearning imagination, to gamification, but we think they’re actually a much better idea. Badges are portable evidence of accomplishment, which can be moved via the Open Badges standard between systems. 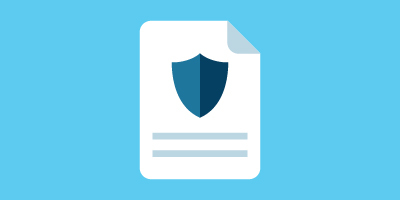 Badges offer real promise for replacing the PDF certificate, in our view. 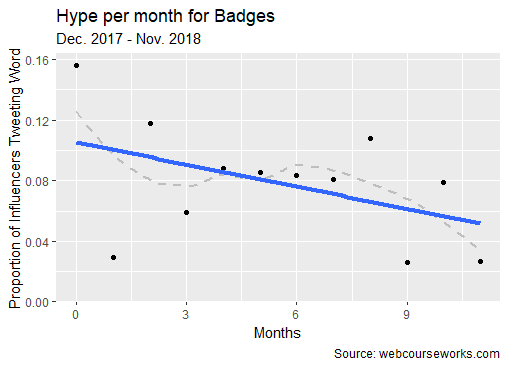 But there’s no arguing with the data: badges had the second-worst slope, an annualized 5%, in our dataset, so we moved them backwards to the Trough of Disillusionment. We hope they’ll reach the Slope of Enlightenment next year. MOOCs (Massive Open Online Courses) are the instructional design concept behind those free courses offered by sites like Coursera, EdX, and Udacity. 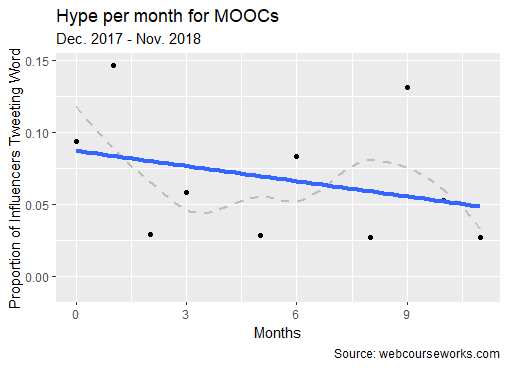 We think MOOCs are good design, but our influencers are evidently no longer enamored with this approach: MOOCs had a negative slope that was only slightly less bad than gamification and badges. Perhaps this is an artifact of our methodology – we have a clear corporatist bent among our influencers, and corporations tend to be disinclined to engage in the open sharing of knowledge entailed in MOOCs. If we had more higher education idealists in our influencer set, would MOOCs already be on the Slope of Enlightenment or Plateau of Productivity? It’s a good question to investigate for next year. Experience API (xAPI) is a technology standard that seeks to bring the tools and techniques of big data to eLearning and also attempts to decouple online learning experiences from the LMS. 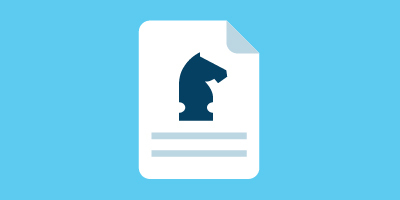 Once hyped as “next generation SCORM” (a good marketing slogan that happened not to be true), xAPI has gone through a difficult period in which practitioners struggled to actually use it. However, we’ve seen more real-world applications in the last year, and more and better tools. 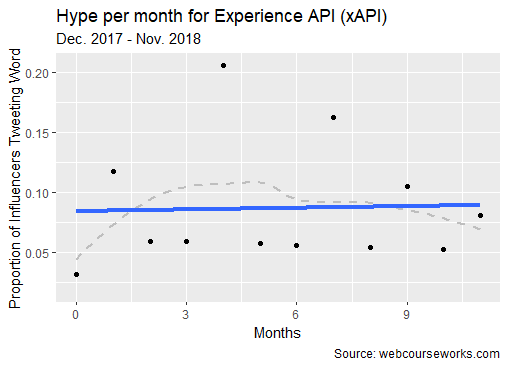 We were happy, therefore, to see that xAPI had a slight positive slope and low overall hype this year, exactly matching the profile of a technology that is climbing its way out of the Trough of Disillusionment. 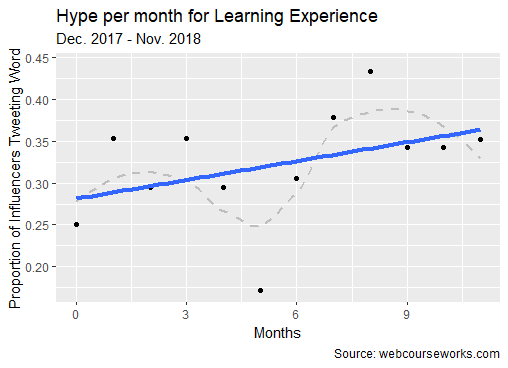 mLearning (mobile learning) has medium overall hype and a nearly flat slope, perfectly fitting the profile of a term that is on the Plateau of Productivity. And this only stands to reason: most popular eLearning tools, from authoring tools to LMSes, now offer mobile responsiveness in the base solution. Simulation as an eLearning activity frequently takes the form of a “Choose Your Own Adventure”-style branching simulation, in which the learner applies skills and knowledge learned in the learning module to a computer simulation of a real-world problem. There is also high-fidelity simulation, which may use physical technology like the talking mannequins of medical simulation to simulate tasks like surgery. 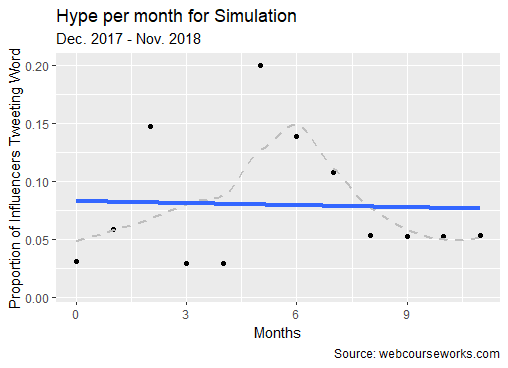 We’ve seen branching simulation get much cheaper and easier to author in the last couple of years, and so we were not surprised to find that the term matched the profile of the Plateau of Productivity this year. That’s it for this year! Check out our past predictions if you don’t believe the hype.